Hershey is now offering personalized flags for their chocolate kisses. Put these in your out of town gift bags, on your guest tables, or in a bowl by your guest book. Who doesn't love some kisses! 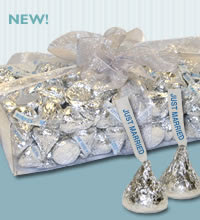 These are so neat - now you can have Best Wishes, Just Married or your Names and Wedding Date on the kiss flags. They even have Its a Girl and Its a Boy for when its baby time! ps- Thanks Emilie for letting me know.